The NF-F12’s stator guide vanes are set out in Varying Angular Distance and feature Vortex-Control Notches. Both measures help to spread the noise emission over a broader frequency spectrum and thus make the fan’s sound pattern more agreeable to the human ear. 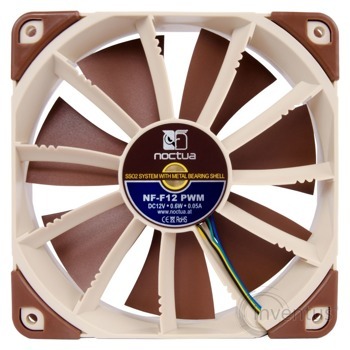 The NF-F12 is the first fan to feature the further optimised second generation of Noctua’s renowned, time-tested SSO bearing. With SSO2, the rear magnet is placed closer to the axis to provide even better stabilisation, precision and durability. 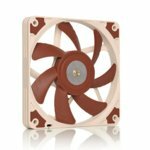 Supporting fully automatic PWM speed control, the NF-F12 uses Noctua’s novel, custom designed NE-FD1 PWM IC that integrates Smooth Commutation Drive (SCD) technology. By providing smoother torque impulses, SCD suppresses PWM switching noises and thus makes the fan quieter at lower speeds. The NF-F12 draws only 0.6W, which is more than 50% less than many fans in the same speed range. 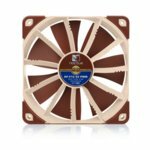 This doesn’t only make it eco-friendly but also cuts down the electricity bill: Compared to a typical 2W fan, this allows you to save about half the price of the NF-F12 after 5 years of continuous use. The NF-F12 is supplied with a Low-Noise Adaptor (L.N.A.) 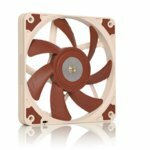 that reduces the maximum fan speed from 1500 to 1200rpm. The L.N.A can be used either to run the fan at a fixed speed of 1200rpm or to cap the maximum speed when using automatic PWM control. The fan’s short 20cm primary cable minimises cable clutter in typical applications while the supplied 30cm extension provides extended reach when necessary. Both cables are fully sleeved and a 4-pin y-cable allows to connect a second NF-F12 fan to the same PWM fan header for automatic control.